I would like to ask if which categories of updates are essential and which are purely optional since I want to minimize my download and integration time. Thanks. Security Update Rollup - This update is recommended to be installed ASAP! And are essential. Non-Security Updates - These updates are optional, though to install/integrate KB3125574-v4 you will need to download some updates in this category. Convenience Update Rollup - Very much recommended to install KB3125574-v4, as it contains nearly all updates Feb 2011 to Apr 2016! Some say this is Service Pack 2 for Windows 7. .NET Framework 3.5.1 Rollup - This is recommended to be installed ASAP! And are essential. Pre-Release - Only download if you're a keen tester of software. Security - Optional, only MSE. Language - Only if your first language is not English. Update Rollup Preview - Test upcoming new rollup for Patch Tuesday. Hope this helps clarify what the categories mean. Thanks steven454 for posting this and keeping it up to date. 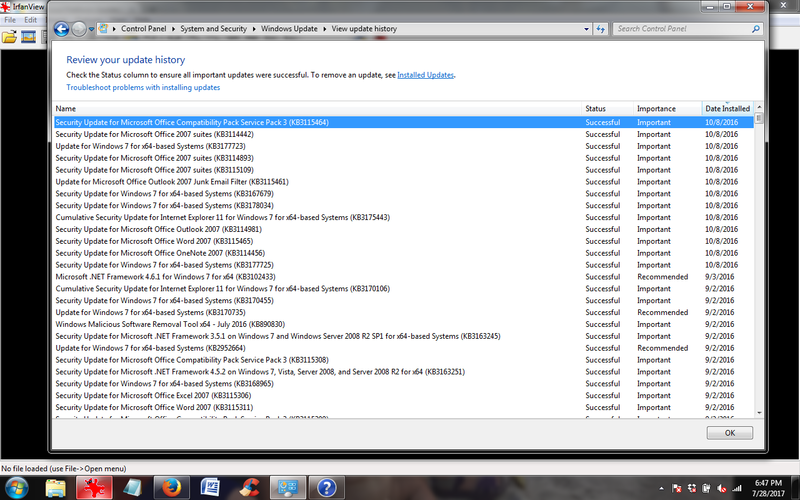 I've been finding my wife's laptop running slow and thought I ought to check its Win7 update history. 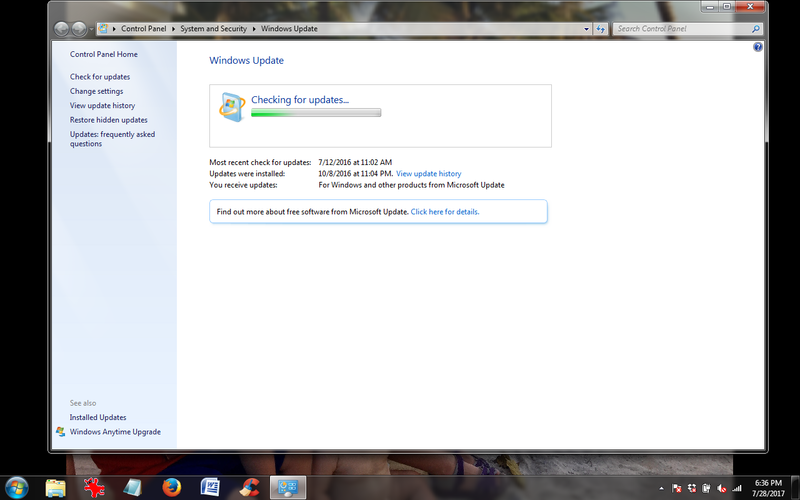 Horrified to see it's now been updating automatically. (See attached screenshots) I couldn't find on the Windows 7 help what that all means but would you kindly tell me if there's no more MS support being produced? If there is/was a cutoff date? I'll look back in a few days meanwhile be well. TeachEnkrat. Windows 7 SP1 is supported until January 14, 2020. Currently it is on extended support. We don't know what happens on January 15, 2020. Will MS extend support atleast one more time like they did with XP multiple times or not. I'm thinking they won't. Thank you so much for your effort. You made my day. As always, Thanks again Steven. MSFN lost a whole lot of comments and files. Please contact the server administrator at webmaster@msfn.org to inform them of the time this error occurred, and the actions you performed just before this error. Yes. We've noticed that issue with all attachments, since MSFN came back online. xper is working on it, and surely the downloads will be working again. Sorry for the inconvenience! Yes I noticed that yesterday when I was updating the posts, I thought I had gone back in time. Hopefully the downloads will work soon. Update - Downloads are working. Hi Steven, On the the latest ulz file (July 10th) the dotnet framework was not downloaded: "ndp472 was not found on the remote server". this is so for both the 32 and 64 versions of the downloads. Yes, as some of those updates have been superseded by the convenience rollup and recently released cumulative update rollup, so you can hide them. Though some are needed for features that are not part of the convenience rollup. Here are two UL's that will let you download the Post Service Pack 1 updates up to: 11th December 2018! Please note - Current and Future CU's will block Intel's Kaby CPU's and AMD Ryzen CPU's and beyond when using Windows Update! Hi, I can't download win7-sp1-x64.ulz file. Sorry, late night and forgot to upload the actual files. They should be available now. Here are two UL's that will let you download the Post Service Pack 1 updates up to: 8th January 2019! Not able to download the file? What are you not able to download, is it the ulz file or a update within the update list?